Designed to deliver efficiency, savings and breathtaking results. Take advantage of Single Pass Colour™ Digital technology as an alternative to high-priced copycenter prints and copies—and enjoy a laundry list of functionality plus high-quality output, long-lasting consumables, and unmatched reliability. Produce up to 99 colour copies from an original page or graphic image—processed directly from your PC or via the network. The ideal digital performer, stand-alone or networked. 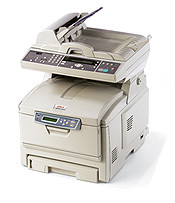 The ES1624n MFP is a compact communication system. Set it up even where space is limited, so individuals and small workgroups can have desktop convenience or easy access to walk-up copying, scanning, PC faxing, and fast network printing. When e-mailing a file, the LCD display directs you to fill in the recipient’s e-mail address (“To”) and the “Subject” line—or select from the e-mail address book—just as you would on your PC. The system scans your document or artwork, saves it and sends it as an attachment via your Ethernet network and SMTP server. Likewise, you can send a file to a folder on the network or over the Internet to a folder on a remote PC or a designated server (FTP site). You can save or send your documents or art as PDF, JPEG, PCX TIFF or M-TIFF files. The ES1624n MFP Colour Multifunctional System from OKI Printing Solutions will give you the impact of colour for your documents, without the impact a high-speed colour system can have on your budget. Now you can get the most breathtaking colour copies and printed documents—as well as crisp, clear black & white—with the ES1624n MFP. It’s fast, flexible and affordable. More than that, it’s your complete Colour CreationCenter!